Just installed a cood-e player, did the upgrades, etc. Also I like to stress I have a DTS HD and Dolby TrueHD capable receiver and cood-e has been setup correctly for audio pass through. However, when I stream a mkv or bluray over the local network, I only get normal DTS / Dolby Digital sound on my receiver. Even though when I check the audio menu, it indicates it's a DTS HD MA stream. I have an old Dune mediaplayer that doesn't support the new audio formats and I was hoping with a new device like the cood-e, it would at least support passing through the complete HD audio streams, instead of just the core. Apparently not. Is this a software issue, or is the hardware incapable of supporting DTS HD / TrueHD? Its a software issue, as they said before, its not licensed as its a streamer and mainly not used for playback. I'm (me and my friend) working on a fix for all android based KODI players. We hope to release tomorrow, please keep an eye on the forums. No, this is different. I'm not talking about decoding DTS/Dolby, but passing through the signal to a capable receiver. You don't need a license for that. Also I did some research and other players based on the same Amlogic S805 chipset seem to be able to forward DTS HD and Dolby truHD. However with the current firmware there's no option to enable this. Add-on works perfect, period. Thanks a million Vekia & Co., you turned a crappy machine into something useful for me. Installed it, but as expected no minds were blown. It's useless. Your script is about enabling stereo down mix, my problem is about HD audio pass thru. Those are different things. Including the ability to set the audio output device probably. Setting these values to true doesn't change anything unfortunately. I get the impression the cood-e development team just disabled a bunch of options they didn't like/understand/whatever. Disappointing really, when internet streaming is possible, local media streaming should be too. DTS-HD and DOLBY-HD works here on passthrough, never the less, we are investigating this. as we are testing with multiple AMP's from different brands. Hi Jeremy, I can confirm myself that Atomsk is right, the DTS-HD and TrueHD are not passing through to my Pioneer VSX-924-K when streaming from my home NAS. I just got my new COOD-E today and did several tests. Also only DTS 5.1 is passing through when playing DTS-HD 7.1 files - but that is probably beacuse only standard DTS core 5.1 is being used instead of DTS-HD MA. Is there any way to fix this in the next firmware? The Audio Add-on Fix is just to get the stereo downmix of HD audio tracks, so I do NOT recommend to install if you want to solve any passthrough issues, it won't help you. So far it seems that passthrough of HD tracks works for some users with specific A/V receivers and not for others. Or is there any update from the COOD-E team? Any info is appreciated... Thanks guys! is hier al een oplossing voor ? 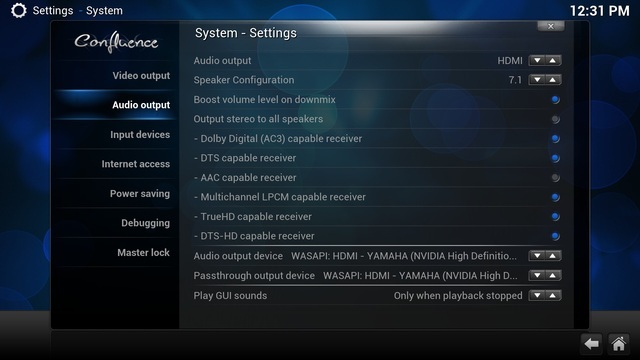 I can also report that HD audio streams are not correctly passed through to my Onkyo TX-NR1008. So it seems that the FW is indeed dropping the HD streams and passes through only the core streams. Was there some reason for doing this? Will there be a FW update fixing this (in v15.2?) and when can we expect this?